At this time of year, many libraries hand out lists of books recommended for summer reading for children and teenagers in different school grades. If yours doesn’t or if you’d like more ideas, visit the terrific site for the Highland Park, Illinois, Public Library. This site has a list of books recommended for each school grade (such as “Hot Fifth Grade Titles” and “Riveting Sixth Grade Books”) divided into categories such as “Adventure,” “Biography,” “Historical Fiction,” “Sports” and “Mysteries.” And unlike the flyers at many libraries, this master list has a link to one or more reviews of each recommended book so you can quickly learn more about it. Two-time Newbery Medal winner Lois Lowry is one of America’s most honored authors of middle-grade fiction. On Saturday One-Minute Book Reviews will have a review of her first picture book, Crow Call, with art by Bagram Ibatoulline, who illustrated Kate DiCamillo’s The Miraculous Journey of Edward Tulane. Miriam’s Cup: A Passover Story. By Fran Manushkin. Illustrated by Bob Dacey. Scholastic, 32 pp., $5.99, paperback. Ages 4 and up. Miriam’s Cup is a picture book that refracts the Passover story through the eyes of a modern family preparing for the holiday. Before guests arrive for the Seder, Mama Pinsky tells her daughter, Miriam, about the “the prophet you are named for.” Mama’s account focuses on the biblical heroine’s role in events more often associated with her brother Moses — his discovery in the bulrushes, his flight from Egypt, the plagues of frogs and other afflictions, and the parting of the Red Sea. The text of Miriam’s Cup is at times stilted. The Pinskys are modern enough to have a Miriam’s Cup at their Seder, but Miriam Pinsky calls her parents “Mama” and “Papa” as though living in the early 20th century. And although Fran Manushkin never says so directly, her book has a feminist slant. (Anybody who doesn’t recall seeing Miriam on the list of prophets in that Bible-as-literature class in college may want to read the entry about her on Wikipedia). But Bob Dacey’s bold watercolors draw you in quickly and help to offset the effect of the anachronisms, and the book includes a bonus: the words and music to Debbie Friedman’s “Miriam’s Song” based on Exodus 15:20–21. Wonders and Miracles won a National Jewish Book Award and is, in effect, a children’s coffee-table book – an exquisite collection of poems, stories, prayers, recipes, and more – that befits the high reputation of Eric A. Kimmel, who wrote the Caldecott Medal runner-up Hershel and the Hanukkah Goblins, illustrated by Trina Schart Hyman. His Passover anthology doen’t include a complete Haggadah, the collection of readings used at the Passover meal. Instead Kimmel walks children through each part of the Seder, explaining why it matters with the help of beautiful illustrations spanning three centuries – from an Egyptian tomb painting to contemporary photographs of three versions of a Miriam’s Cup (silver, glass, and clay). If the publisher and School Library Journal disagree on the ages for this book, it’s because Wonders and Miracles has something for all. J. Patrick Lewis’s simple rhyming poem “Spirit of the Seder” would suit preschoolers. Gershon Levine’s story “And You Shall Teach Your Children” makes a good introduction for adolescents to the Soviet Jews known as “refusniks” who lost their jobs or were investigated by the secret police if they tried to practice Judaism or move to Israel. And adults might appreciate the recipes for almond macaroons (“a lovely change from the traditional coconut macaroons”) or both an Ashkenazic and Sephardic charoset. Ages: The publisher recommends Wonders and Miracles for ages 4–8 while School Library Journal suggests 9–12. Both are right. But very young children might destroy this book while some 11- and 12-year-olds might be too old for some of it. I would probably give it to 6-to-9-year-olds or as a “family” gift. Published: March 2006 and Feb. 1998 (paperback and hardcover editions of Miriam’s Cup) and Feb. 2004 (Wonders and Miracles, hardcover only available). This is a repost of a review that appeared in slightly different form in 2007. You can also follow Janice Harayda (@janiceharayda) on Twitter, where she often comments on children’s books. If you’re looking good books about bunnies, beware of the words “based on.” That phrase on a cover is usually a tip-off that you aren’t getting the original text, pictures or both. And some books omit even that red flag. 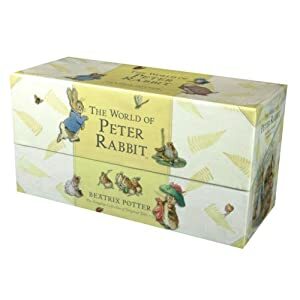 Two examples are Peter Rabbit (Ideals, $3.95) and The Velveteen Rabbit (Ideals, $3.95), which have the words of Beatrix Potter and Margery Williams but pictures far inferior to those in the best-known editions of their books. Publishers can do this because The Tale of Peter Rabbit and The Velveteen Rabbit are out of copyright in the U.S. (though not necessarily in all other countries). Some knock-offs of these classics cost as much as books with the original text and art. So why not go for the real thing? Or consider any of the many other good books about rabbits. They include Pat the Bunny (Golden Books, $9.99, ages 1–3), by Dorothy Kunhardt; The Runaway Bunny (HarperCollins, $16.99, ages 2–5), by Margaret Wise Brown and Clement Hurd; and Bunny Cakes and Bunny Money (Picture Puffins, $5.99 each, ages 3–5), by Rosemary Wells or other titles in Wells’s hilarious “Max and Ruby” series about a brother and sister rabbit. For ages 6 and up, consider the chapter-books about Bunnicula the “vampire rabbit” (well, it does drain juice from vegetables), by James Howe and Deborah Howe, illustrated Alan Daniel. The titles in this comic mystery series may tell you all you need to know: Bunnicula, Bunnicula Strikes Again!, Howliday Inn, Return to Howliday Inn and The Celery Stalks at Midnight (Aladdin, $4.99–$5.99 each). This post first appeared in slightly different form in 2007. You can also follow Janice Harayda (@janiceharayda) on Twitter. A farmer sacrifices his rice crop to save his neighbors from a monster wave in Kimiko Kajikawa’s recent picture book Tsunami! (Philomel, 32 pp., $16.99, ages 4 and up), illustrated by Caldecott medalist Ed Young and adapted from a story by Lafcadio Hearn. “Young knows how to evoke devastation without needless gore, and throughout the book he does with it vibrant collage-like images that, unlike his more realistic cover picture, have an abstract-expressionist spirit,” an Oct. 3 review on this site said. “He suggests – instead of showing in bloody detail – the power of a monster wave.” Read the full review here. Winter still has enough muscle here in New Jersey that the library was closed for snow yesterday, so I couldn’t put my hands on a trailblazing book about the kind of weather we’re having now, Ezra Jack Keats’s The Snowy Day (Puffin, 40 pp., $6.99, paperback, and other editions). But an excellent reference book on children’s literature puts its achievement in context. “Keats illustrated nearly a dozen books before writing his first, The Snowy Day, which won the 1963 Caldecott Medal,” former children’s librarian Mary Mehlman Burns writes in The Essential Guide to Children’s Books and Their Creators(Houghton Mifflin, 2002), edited by Anita Silvey. “A celebration of color, texture, design, and childhood wonder, The Snowy Day is significant in that it was one of the first picture books in which a minority child is seen as Everychild. Years before, Keats had come across photos of a young boy, and he recalled that ‘his expressive face, his body attitudes, the way he wore his clothes, totally captivated me.’ The boy was to become Peter, who, in his red snowsuit, discovers the joys of dragging sticks and making tracks in the snow. After its publication, Keats found out that the photos had come from a 1940 Life magazine – he had retained the images for over 20 years. A generation of readers – black and white – is grateful to The Snowy Day, sometimes called “the book that broke the color barrier” in picture books from mainstream publishers. The editions include DVD-and-book gift set from Viking that also has Whistle for Willie. This review first appeared in 2008. You can also follow Janice Harayda (@janiceharayda) on Twitter. She satirizes the American literary culture, such as it is, on her Fake Book News page (@fakebooknews) on Twitter at www.twitter.com/FakeBookNews.